Chicken Fingers are a universal staple on all children’s menus across the United States. Chicken Fingers are most often fried and therefore loaded with calories and fat. A Recipe Rebuild was in order since my toddler enjoys his chicken fingers! This recipe makes a flavorful, crunchy-coated yet moist chicken finger. It is served here with a skinny honey mustard dip but can also be served with barbeque sauce. It is a super easy weeknight meal that kids can also help out with. Serve along with roasted sweet potatoes or baked sweet potato fries for a fabulous and healthy family friendly meal! This Recipe Rebuild is significantly lower in fat and calories than its original counterpart by omitting oil and baking instead of frying. Skinless chicken is a great source of lean protein. By using whole-wheat breadcrumbs we add fiber. Adding seasonings to enhance flavor replaces the need for fat. This kid friendly received a "rebuild" to make it much healthier. Put egg and egg white in one bowl and lightly beat with a fork. In another bowl combine Panko, whole-wheat breadcrumbs and remaining seasonings through salt and pepper. Take each chicken strip and dip into the egg mix and coat well, then press into the breadcrumb mix to coat well and place on a baking sheet covered with parchment paper. Repeat until all chicken fingers are coated. Bake for 10 minutes, flip the chicken fingers over and bake for another 10 minutes for total bake time of 20 minutes. Meanwhile prepare sauce ingredients by whisking all sauce ingredients well. 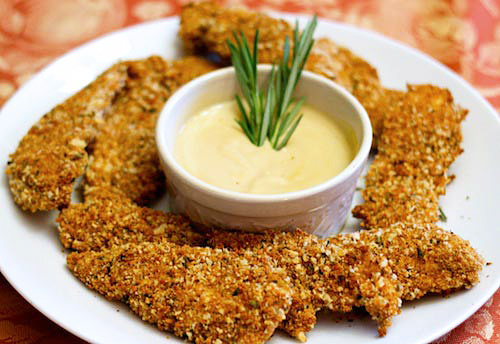 Serve chicken fingers warm alongside Skinny Honey Mustard sauce.